When I started this year, my goal was to complete twelve Project Linus quilts. Which was aggressive, especially since there ended up being so. much. other sewing I wanted to do. I am near completion of that goal, and I am starting to think about what next years goal will be. I know next year will want to do more quality, less quantity. And to start to use the scraps I have accumulated. One project I loved this year was this one – all scraps, all awesome. I think for 2015, I want to make 6 more quilts like that – inspired by paintings with colors I love. 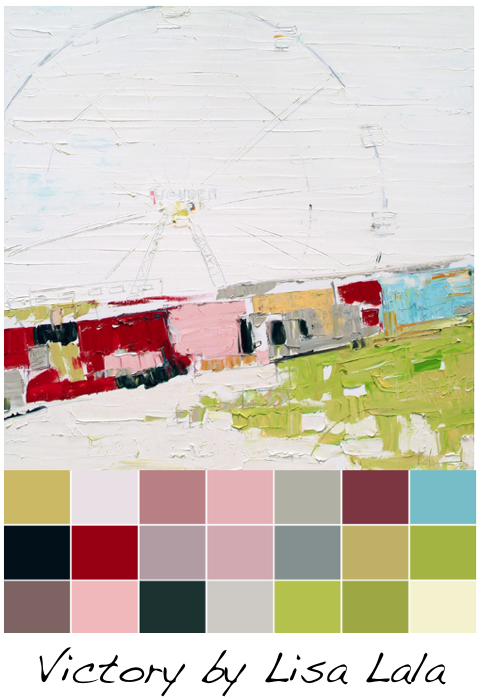 I think my first one will be in this palette from this amazing painting by Lisa Lala that is at the Albrecht-Kemper museum. The color palette is just so amazing to me. And maybe I will try to sell them. Maybe. That makes me feel a lot of pressure – not sure why. But maybe I will.